Test cricket is the ultimate form of cricket as it tests a player over a period of five days. In today's day and age, with the advent of T20 cricket, it is very rare that batsmen are willing to spend long hours at the crease. The game of cricket is now witnessing batsmen scoring centuries in a session. Runs are being scored at a quicker rate with batsmen willing to take more and more risks to capitalise on every run scoring opportunity. Since the year 2000, there have been six instances of wicketless days in Test cricket. Here is a look at the said six days. The second Test between India and Australia at the Eden Gardens in Kolkata was indeed a phenomenal one. Batting first, despite a 7 wicket haul from Harbhajan Singh (which included a hat-trick), Australia scored 445. India were already 1-0 down in the 3 match Test series having lost the first Test at Mumbai. India were bowled out for just 171 in their first innings and the Aussies enforced the follow-on. The duo added 376 runs and severely punished all the Australian bowlers. Laxman and Dravid batted throughout the fourth day of the Test i.e. on March 14, 2001, without being dismissed and scored 335 runs on the said day. The experienced Australian bowling attack comprising of McGrath, Gillespie, Warne and Kasprowicz were made to look ordinary and had no success against Laxman and Dravid. As many as 9 bowlers were used by the Australian captain Steve Waugh to break the partnership. Riding on Laxman's 281 and Dravid's 180, India posted 657 runs in their second innings. Australia were bowled out for just 212 runs in 68.3 overs on the fifth day and India won a dramatic Test by 171 runs. 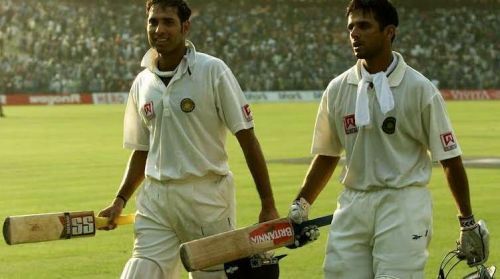 The highlight of the Test win was the batting of Dravid and Laxman on March 14, 2001. The duo had the temperament to bat for a long period of time and to tire out the bowlers. India went on to beat Australia 2-1 in the 3 match series and the partnership of Laxman and Dravid laid the foundation for the said series win.